A 4.5 Earth-mass planet has been found within the habitable zone of a nearby star, which itself is a member of a triple star system. The planet, which takes 28 days to orbit its host star, has at least one super-Earth companion orbiting on a tighter orbit in just 7.2 days. The international team of astronomers used ground-based telescopes to make the discovery, and also found evidence for a gas giant planet and another super-Earth in the same system, but further observations are needed to confirm the data. 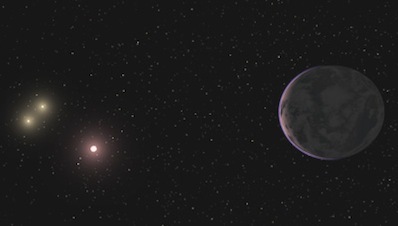 The newly discovered super-Earth is part of a triple-star system. Image: Guillem Anglada-Escudé, Carnegie Institution. The planets orbit 22 light year distant M-class dwarf star GJ667C, and its stellar siblings are both orange K-dwarfs. These stars have only a quarter of the heavy elements that our Sun possesses, depleted in some of the metal-rich ingredients that go into planet building. The super-Earth is thought to absorb the same amount of energy from its star that the Earth does from the Sun, although in the form of infrared radiation. Orbiting in the habitable zone, where temperatures are neither too hot nor too cold for liquid water to exist on the planet's surface, GJ667Cc could be the best candidate yet to support liquid water. The team used public data from the European Southern Observatory and incorporated new measurements from the Keck Observatory’s High Resolution Echelle Spectrograph and the new Carnegie Planet Finder Spectrograph at the Magellan II Telescope to detect the tiny wobbles in the star's motion caused by the planet's gravitational tug.